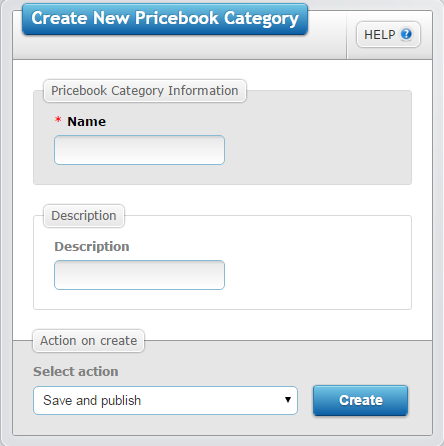 Pricebook” categories are products or services categories which you offered to your customers. You will need to defined the suitable categories for your company to make the system usage more effective and suitable with company policy. “Pricebook” is also a list of products supplied by the company. For example; company products. Add : Click on this button to add new category. Edit : Click on this button to update the category. Delete : Click on this button to erase data. However, data can only be erased if it is yet to be used. Once used, it can no longer be erased. 1. You can determine “Name” and “Description” of the new category. Name : Enter the new category name. Description : Enter description related to the category. Create : Click on this button to enter the new category.